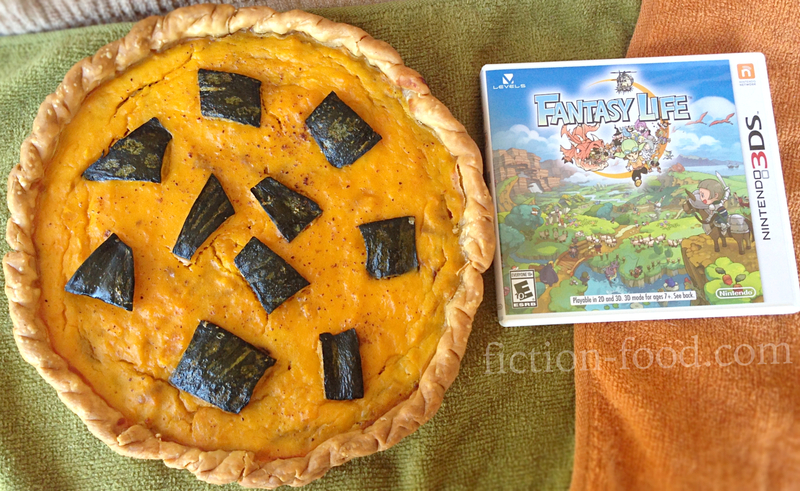 Fiction-Food Café: Pumpkin (Kabocha) Quiche from "Fantasy Life"
Pumpkin (Kabocha) Quiche from "Fantasy Life"
From Level 5 (the creators of my favorite video game "Ni no Kuni") and Nintendo comes a wonderful JRPG 3DS game called "Fantasy Life" that gives you the opportunity to experience twelve different professions while exploring and adventuring in the magical land of Reveria. 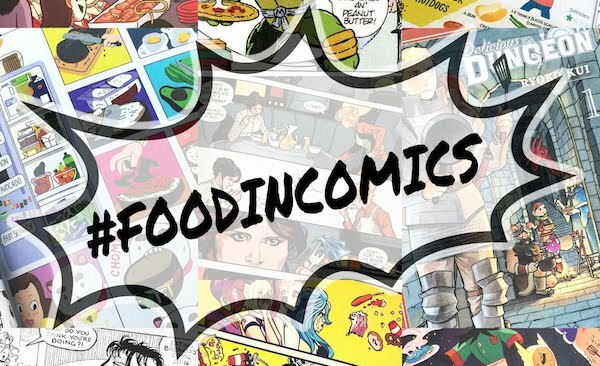 I chose to be a cook, of course, and completed the storyline without taking on any other professions (woot! Gotta represent the cooks!). There is a plethora of food items that you can acquire at the various markets, cafes, bars, and restaurants, or you can make them yourself (but only if you're a cook!). 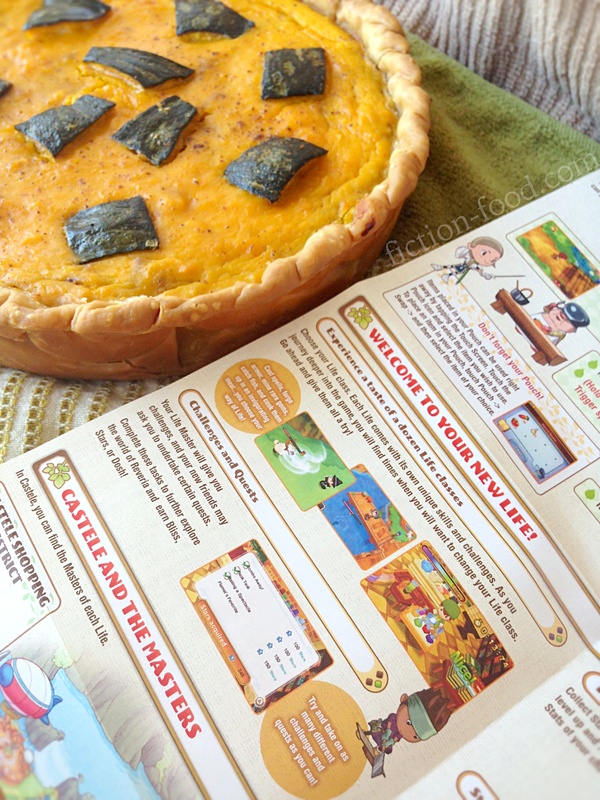 There are several "Fantasy Life" foods that I'd like to make for this blog, but because it's Autumn and Thanksgiving is in a few days, I chose this one! 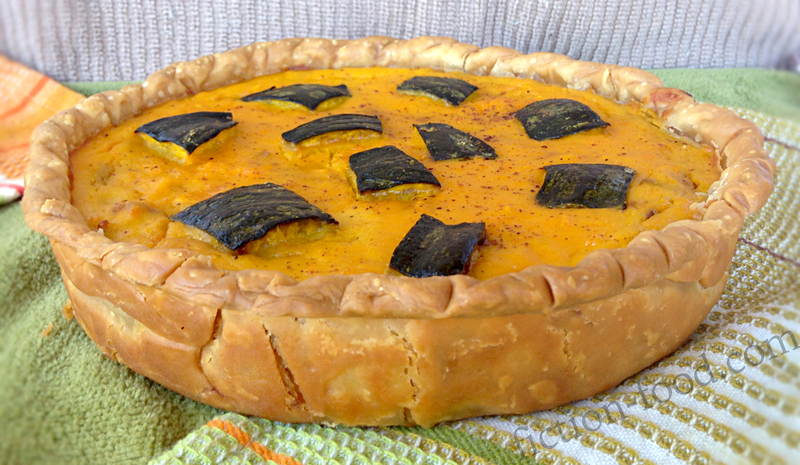 Sold at The Spice Rack restaurant in Al Maajik's Spelltown district, this magical pumpkin quiche will boost your HP and increase your vitality and focus. 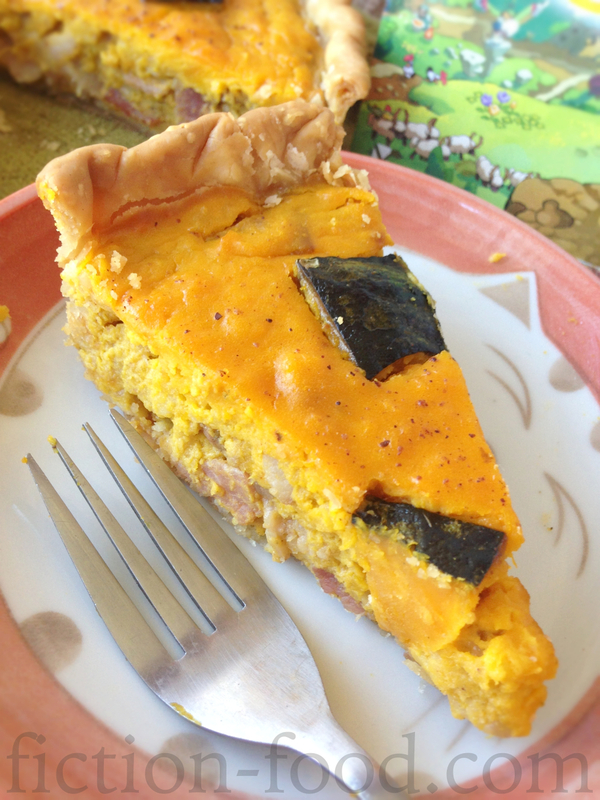 Note: The in-game ingredients are pumpkin–the Japanese kind with tasty green skin, called kabocha (known as kabocha squash here in the states)–milk, and eggs, but I added bacon and onions as well because they bring a great flavor. 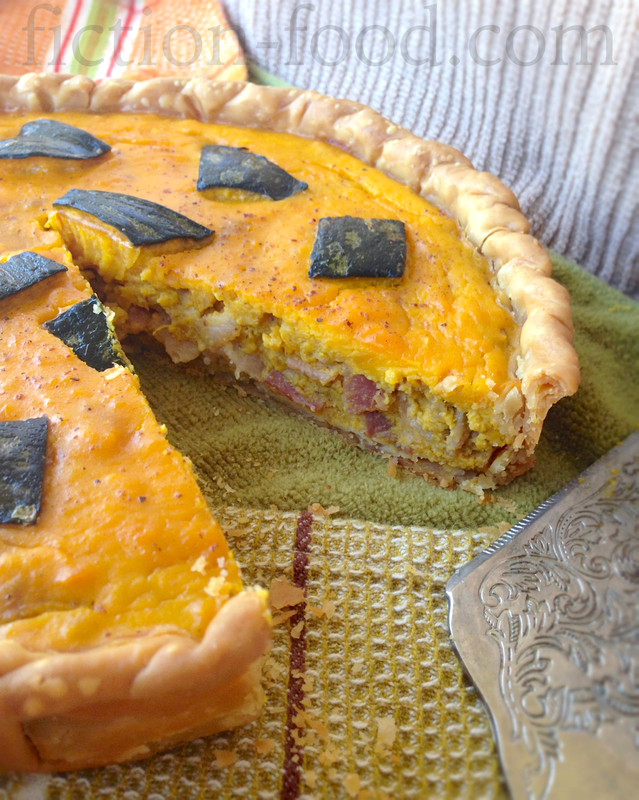 If you'd like to leave out the bacon to make this a vegetarian dish, go right ahead! No substitutions needed. 1. Pre-bake the pie crust in a 350ºF oven for about 15 minutes, or until set. Remove & set aside. Turn oven temperature to 400°F. Line a large baking tray with parchment paper or foil. In a large bowl, toss the kabocha chunks with the tablespoon of oil. Spread the chunks out in a single layer on the tray, skin sides up, & bake for 30 mins until tender. Remove from oven & let cool until touchable. Turn oven temperature back to 350ºF. 2. In a medium pan on medium heat, sauté the onion, bacon, & spices for 5 minutes. Remove the green skin from 1 1/2 packed-cup-worth of kabocha pieces (the skin is tasty & healthy so eat it if you want!) & plop the orange portions into a large bowl, if you have an immersion blender, or large standing blender. Add in the eggs, cream, & milk & blend until smooth. Scoop out 1 cup of the mixture & set aside. 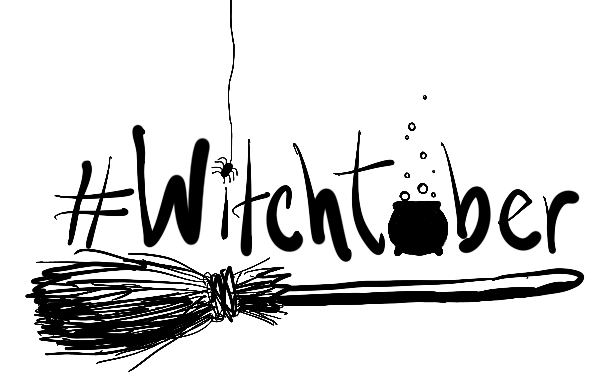 Add the cheese & bacon/onion/spices to the large bowl, or blender, of pumpkin mixture & stir to combine (do not blend). Pour into the pre-baked pie crust & spread evenly. Spoon on & spread out the reserved cup of pumpkin mixture & then place several of the remaining kabocha chunks on top, green side up. Place a pie shield (or foil) around the crust & bake for 45-50 minutes, or until the center no longer jiggles, removing the shield within the last 10 minutes. Best served warm. You could make the crust crispier with 5 tablespoon vodka. I prefer 1/2 teaspoon of nutmeg and 1/4 teaspoon pumpkin spice and you can never go wrong with more bacon to the dish!